I was remiss in announcing the start of National Poetry Month (belated trumpet blast, cymbal crash), but one thing which I haven’t been lax on is my Poem-a-Day habit. Every day, as part of my morning constitutional, I open the latest volume of verse I’m reading and ingest a few stanzas of Grade-A, 100-proof poetry. So, for me, every month is Poetry Month—maybe that’s why I overlooked its in-like-a-lamb arrival on Sunday. I’m working my way through the 762-page The Poets Laureate Anthology. I started reading it last April. At 1-3 poems per day, I proceed at the pace of molasses moving across a glacier. But that’s the speed which suits me best. Ingesting more than three poems in a single sitting makes my head too crowded. I mean, all those words bumping into each other, throwing elbows--it's too much linguistic cacophony. Last weekend, I took a short break from the poets laureate for a quick trip through a 28-page chapbook published last year by The Kent State University Press: So, How Was the War? by Hugh Martin. It was a quick read, but it was also an unforgettable one. Let's put it this way: if these poems were drinks, then I spent the weekend tossing fiery shots of whiskey down my gullet. In “The War Was Good, Thank You,” Martin answers the chapbook’s titular question by not answering it. Instead, he gives us six disparate stanzas, snapshots from a year in the desert, which cumulatively try to answer the unanswerable. place ice cubes on my closed eyelids and let them melt. No one can fully understand the rhyme or reason of war. Sometimes, not even those who were in it. It's a mind-blowing thing, this mobilization of countries who clash and kill, whether it's over ideology or real estate. That sense of disturbed wonder really comes across in these poems. soaring past moonlight and minarets. And what do you do with the war after you return to the States? How do you deal with the hot, clanging memory of friends lost and enemies killed? You drink so much coffee that your hands vibrate "like the cones of subwoofers." You wander the aisles of Wal-Mart as blue-vested employees insist you have a nice day. You try to forget about doomed children calling "Mister! Mister!" 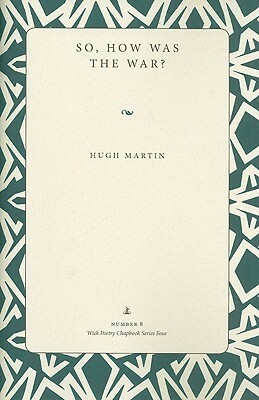 Or, if you're like Martin, you seek healing in poetry. Writing from a foxhole at infantry-grunt level, Martin has brought the war home and dumped it in our laps. Never again will we casually ask, “So, how was the war?” Now we know. Now we see it was hard, brutal, frustrating, and an unshakable stink for those who returned. These thoughts of mine always sounds trite, even whining, perhaps a bit guilty. I served in Nam in the Navy, although I was on a ship in the Tonkin Gulf, eating good food every day, watching movies at night, even getting stoned after my shift as a radioman, where I sent messages about damaged Marines and others. I never felt the connection of those who experienced actual battle, or saw death and destruction. Yet over 40 years later, that war (and the echos of my father's war)and what it was and was not is still with me.